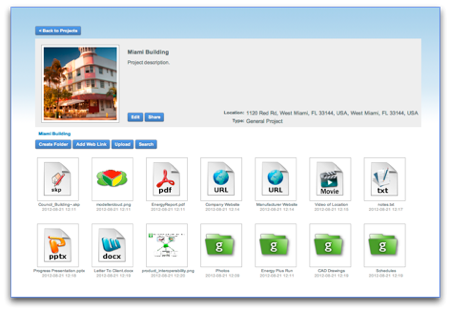 gWorkspace is our cloud-based building information management system. Providing a central location for data gathering and coordination with team members in the cloud, gWorkspace is like a secure virtual filing cabinet enabling you to store all information pertaining to each project. Unlike a physical filing cabinet, you can also share your projects with multiple users to work together on building projects using stored information including photographs, floor plans, survey reports, repeat analysis runs to achieve a common goal or to show results to clients. gWorkspace features are available from within all greenspaceLive gTools. As soon as you start saving and uploading your work to gWorkspace, it's automatically available anywhere and backed up. No expensive costs or training required. You can store all files of your models, energy analysis runs, EnergyPlus reports and EPC's to our cloud storage system. gWorkspace give you access to your files and documentation from any location and, since the data is held offsite, your data is secured from theft, fire or any other damages that might happen to your local computer / business. Your most up to date files, available to you and your connections, instantly. No more fragmented versions of documents or email attachments to your team. Simply log in for the latest version. gWorkspace will create time signatured versions of your files . Versioning works with 3D models, energy runs, images, documents, and any other type of file. Once file versioning is enabled your files will be backed up each time a change is made, and you can move backwards and forwards through your file's history and retrieve the file at any stage. This can be particularly valuable while modelling, as you can recover from mistakes made, and also have various different versions of your model. 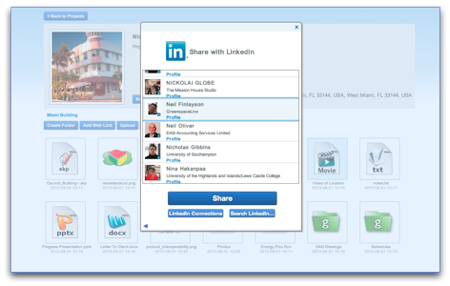 Integration of Social Media throughout gWorkspace facilitates collaboration and promotes sharing of projects. Just choose a contact from your connections and instantly grant access to view or edit your projects. Additionally we have included an inbuilt messaging & notification system, you can now instantly connect to your colleagues or clients about your project, regardless of you or your team’s location. gWorkspace supports the latest HTML 5 techniques for file handling. This means that you can simply drag and drop files from your desktop into gWorkspace projects. You can also add Web Links to provide access to relevant websites, and you can link to youTube and Vimeo videos which will then be played right from inside gWorkspace. Ability to create a folder for each project and include sub folders. Upload facility for any file format such as, PowerPoint, Word, photos PDF files etc. Access your files from anywhere with an internet connection. Share each folder with colleagues and project stakeholders. Social Media integration with LinkedIn and Facebook. Fully integrated with gModeller and gEnergy. 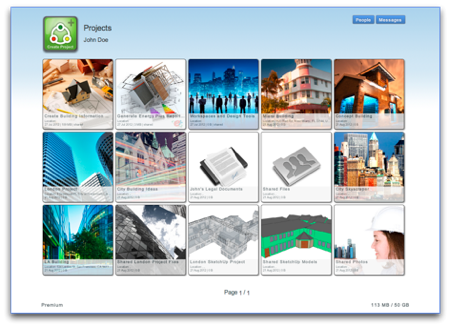 GreenspaceLive's gWorkspace is designed to provide 99.999999999% durability and 99.99% availability of objects over a given year as well as being capable to sustain the concurrent loss of data in two facilities. Access rights are managed by you as the administrator and all permissions for your gWorkspace are controlled by you. Authentication: Objects can be made private or public, and shared to specific users. Data is backed up in multiple physical locations. Accidental file deletion recovery facility.